All of our Founders have one thing in common. They are each using their real estate business to Give Back to their community or the environment. 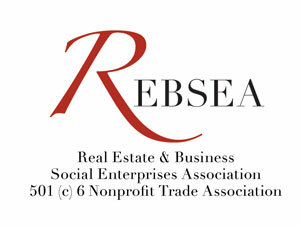 Our organization is called REBSEA, the Real Estate & Business Social Enterprises Association, a 501(c)(6) non profit trade association. We represent All real estate agents and businesses who actively Give Back to the communities they serve in every conceivable way, shape, and form. Our mission is to drive business to our members so that you can continue to do exactly what you are already doing, and more of it ! This is how Real Estate Social Enterprises are making a difference to Non-Profits and the Environment. We will start featuring our Founders in our communications to illustrate the variety of ways in which REBSEA members Give Back. In addition to the examples below, many of our Founders use the income from their real estate business to support specific non profit organizations that they personally are either directly involved with or feel passionately about. Many of our Founders have branded themselves as 'the Realtor who Gives Back', so to speak, by stating clearly on their websites that a % of each commission they earn is donated to the non profit organization of their client's choice. It is important to understand that while some serve very wealthy communities with dynamic markets around large cities from the United States to Canada, others live in smaller, more modest, even rural areas with less-transient populations. Some have kids in college and large overheads while others are able to contribute more by virtue of their personal circumstances. Each situation is unique but they all strive to do what they can to help those in need. Some of our Founders are real estate companies where all of the agents contribute to a fund that makes donations to their local non profit organizations. Collectively these agents are making a profound difference for many in their communities. Some of our Founders use their real estate business to support themselves and the non profit organizations they have created and manage while working full time as a Realtor. Sometimes they receive help and donations from other Realtors in their community. They address issues such as underserved children and animal rights. Read the profiles of Dianne Mintz and Tom Bienkowski to see great examples of how one person can have a major impact in their community. Some of our Founders belong to one or more other organizations with a business model with a 'very specific mission'. Three examples are; Homes For Heroes, Investing In Communities, and EcoBroker International. Homes For Heroes is a national program that helps local "heroes" such as Fire Fighters, Police, Teachers, and Military. In this program the participating Realtor Gives Back a % of their commission to these "heroes" to help with closing costs, repairs, furniture or whatever is needed to enable them to make a home for their family. Investing In Communities is a Chicago based organization that creates partnerships with local non profit organizations. IIC members pledge a % of each commission received through the IIC referral network to one or more of the partnering NPOs. We have several IIC members among the Founders of RRBSEA. 1) Non profit organizations can use our network for direct fundraising. their preference to work with people and companies who Give Back. 3) Creating referral business from our national network of like minded individuals. Please visit our website at www.rebsea.org for more information or contact us directly either at 855-352-4973 or info@rebsea.org.